Hirschman, and his closest five pursuers from 2004, were all veteran drivers with at least 15 career victories each and/or at least one championship of their own. Those guys – Eddie Flemke, Marquis, Ted Christopher, Rick Fuller and Jamie Tomaino are who Hirschman expects to be battling again this year. And a few new combinations might be up in the points this year as well. Late last year, on his way to an eventual championship in the NASCAR Featherlite Modified Series (now known as the Whelen Modified Tour) rumors started to fly that Tony Hirschman might not be back for a full season in 2005. The rumors even turned into newsprint when the possibility of a Hirschman semi-retirement was published in a Connecticut newspaper. “I’ll be back again this year,” Hirschman says without any doubt in his voice. And in an interesting turnabout, the popular consensus is that Hirschman will be back with a vengeance. The same members of the media that whispered about his exit from Modified racing last year voted him this week as their favorite to win the 2005 championship in NASCAR’s annual Pre-Season Media Poll. The rumors can be traced back to the fact that Hirschman’s 2004 title campaign was a grinding one. 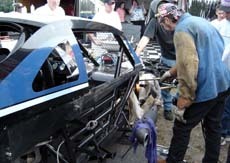 He competed throughout the entire season with only one racecar – a fete practically unheard of for top teams in modern day NASCAR Touring competition. Hirschman downplayed the rumors at the time, but told Speed51.com in October that he would be thinking things over in the off-season. Now the new season is less than a month away and Hirschman is back home in the garage every night. In typical low-key Hirschman fashion, he is quick to point out that if push came to shove, he had other options last year, including borrowing his son Matt’s RoC Modified, so he doesn’t take too much credit for completing the entire season with one mount. Having just one car made for some hectic times at the track, like when a heat race wreck damaged the #48 heavily the day before the Thompson 300. But in a move that could spell trouble for the rest of the Modified field, Hirschman is planning on having a proper back-up car for at least part of 2005. Hirschman thinks having a second car might make things easier, but he’s not sure if it will translate to increased success on the track. Making the most of a bad day, like this spin at Riverhead, is what makes a champion. 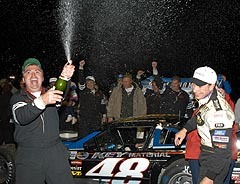 This moment of celebration, after clinching the championship at Thompson's World Series, pretty much defines Hirschman's 2004 season. The #48 team doesn't have a showcar either. Here is the battle proven car on display in the lobby of the Mohegan Sun Casino while the NASCAR Modified Banquet was being held. up with four victories in 1990, but took a career detour into Busch North competition for the next few seasons. He was the 1991 Busch North Rookie of the Year and won a 1992 event at Oxford Plains Speedway (ME), but he didn’t have the success that he was used to in the Modifieds. So when he returned to that world full-time, he did it in style. 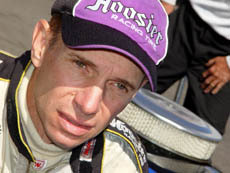 Hirschman was crowned the champion in his first two seasons back [1995 and 1996] as well as in 1999. Since his return ten years ago, he has only been beat for the championship by three drivers – Mike Stefanik, Jerry Marquis and Todd Szegedy. The 2004 season was a perfect balance for Hirschman. He was aggressive at times, like at Stafford when he got together with Donny Lia in a battle up front late in the race, or in the controversial Thompson 300 when he won the final 100-lap segment after his car was heavily damaged in a heat race wreck. But more often than not, he raced his own race and quietly took the best result that circumstances allowed him on a given week. On four occasions, that turned into a victory, but on most nights, that meant a second, third or fifth place finish. Hirschman’s consistency was noticed by his competitors and if his challengers can learn how to duplicate his balance, it could make for a tough title defense. So even though Hirschman is watching his back – he doesn’t quite know who to be most worried about yet. So as the tour winds down in the fall, the complexion of that top five might vary. It could have a few young chargers in it such as Doug Coby, Nevin George, Chuck Hossfeld or Donny Lia. It could have a former champ or two like Rick Fuller, Jerry Marquis or Jamie Tomaino. Wily veterans Ted Christopher and Eddie Flemke should be there. But one thing is a pretty safe bet –Hirschman should be right in the thick of things as he seeks his fifth NASCAR Modified title. Hirschman knows that there are plenty of guys to look out for in 2005.